The people playing Blackjack at casinos mean serious business. They will not tolerate a newbie that does not know how to act when situations arise, and situations will arise. You absolutely can’t sit back and do nothing. You need to know the various signals and how to make them appropriately for the decision you want to make. Get comfortable with this and the rest is not so bad. It will take some getting used to, but the symbols that designate the various options will be right in front of you. If you think Blackjack is fast online, wait till you see it live. The game moves really fast. There will be players in front and behind you. If you do not keep up, you may get switched out. 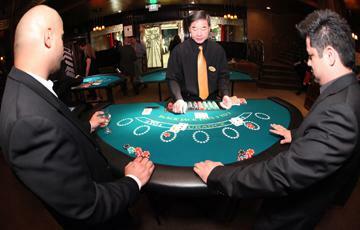 At a live casino the dealers work very, very fast and the other players at the table will be waiting on you to act. It is not a good idea to hold people up. There is going to be a lot of pressure to make your decisions quickly. Distractions will abound at the casino, especially from other players. Some players may be talking to you about the bad hands they have been getting or whatever. Other players might feel they need to give you the one gift that everyone is very willing to give freely: advice. They will do that every now and then, and that will break your train of thought. You absolutely have to count on this to happen if you want to keep your head in the game. You must conquer it. This, obviously, will occur as well. The cocktail waitress will bring you your drink, and she will most likely be pretty. Maybe casino security had to act on something close to where you are playing. The Pit Boss might come over and watch you if you are winning. That is nothing to be worried about, unless you are cheating, of course. This must not bother you. The point is that there will always be something to distract you. If you want to play well, you will be prepared for this. You must keep your concentration in order to apply whichever basic strategy you plan on using. If you know what to expect at a Blackjack table and prepare for all of these things then you will have a much better experience playing Blackjack at a casino. If you are very used to playing at an online casino like Silver Oak, then the live casino experience may be a little shocking. The main thing is to ALWAYS keep your head in the game, ALWAYS.